She is the symbol of eccentricity, outspokenness and outlandishness. Her signature and unmistakable lilac wave and flamboyant cat eye glasses inspired the creation of the 2015 national costume for Miss Universe Australia. Some dubbed it the most hideous design ever, yet it won the heart of Australians and was voted as the chosen costume of the year to represent the nation. The boisterous yet glittery suburbia housewife from Moonee Ponds started her career in the 1950s. She travelled across the globe, made a big name for herself, and successfully owned several chat and game shows in the UK in the 1980s. She appeared before the Queen of England and caused explosive laughter to the ecstatic audience at Buckingham Palace. For the younger generations, she is well remembered for her outrageous fashion style and affectionate character in the role of Claire Otoms in the popular Ally Mcbeal legal comedy drama in 2001 and 2002. The inspiring mother of four achieved her status of “Superstar”, to “Megastar” and finally “Gigastar” in the span of decades. She was the face of Australian postage stamp in 2006, and was invited as a special performing guest at the Closing Ceremony of the Commonwealth Games the same year in Melbourne, where she brought wild exhilaration to the audience with her cheeky song lyrics “And if you’ve been to Melbourne, You can give Sydney a miss.” She was the voice covering the BBC-1 broadcast of “William and Kate: the Royal Wedding” in year 2011, and her shocking satirical comments on Spanish language caused an outrage in the Hispanic community in 2003. Dame Edna Everage was created in the 1950s by Melbourne-born Barry Humphries. Barry is her alter ego, her astute yet aloof entrepreneur and manager, possesses a completely different set of personalities from the loud and sometimes tasteless Dame Edna. 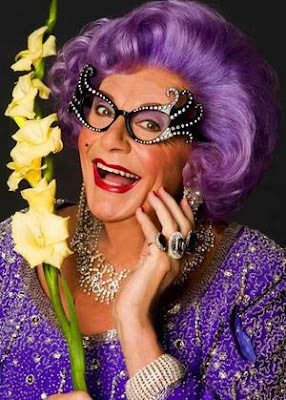 Dame Edna pokes fun at political leaders without mincing words, ridicules the cult of celebrity and mocks class snobbery. She is both guffaw inducing and the cause of stormy controversies. Barry Humphries, on the other hand, is composed and shrewd. Sometimes, it is easy to forget they are one and the same. Apart from a not very flattering sculpture, the city of Melbourne also renamed a disgraceful dead-end lane on the south of Little Collins Street after the glamorous Dame Edna in year 2007. A great location, without dispute, strategically situated between the Elizabeth and Swanston Streets and opposite the famous Royal Arcade; but why is the lane so rundown and depressing is something beyond me. Dirty and dodgy-looking graffiti scrawled uglily on one side of the wall, and the other was occupied by neglected and boring rough stone surface. Dame Edna did not attend the renaming ceremony in 2007, but was represented by ten of her lookalikes with “wisteria hue” wigs. I could have imagined Dame Edna sarcastic remarks should she witness the state of the lane named after her glamorous self. Where are the trendy and exciting street arts such as those colonizing the other celebrity-graced ACDC Lane? 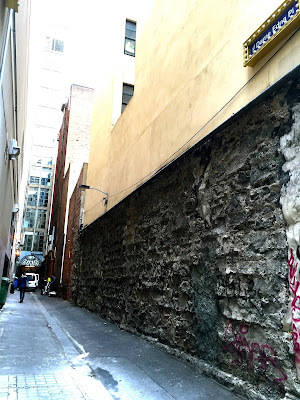 Where are the chic bars and dashing comedy clubs hidden in many secretive alleyways in the city of Melbourne? Where are the sparkles, the vivacities and the flashiness well linked to the showy Dame Edna? Apart from that few pathetic, hardly visible tiny stars adorning the floor, where is the shadow and reflection of the glorious Dame Edna? Come on Melbourne, surely we can do better than that?